The front rack is the position we typically see every Tuesday when we work on cleans. This is also the position we need to master for our Monday press series, and anytime we need to get something from the ground to our shoulders, and/or maintain something in the front rack position. The overhead squat (OHS) is where the inefficient position isn’t necessarily comfortable, but is easier due to bicep head/rotator cuff extension, and not proper scapular retraction and range of motion (ROM). The front rack is alternatively an inefficient position, the comfortable position, which is dangerously bad for you. The front rack position, even for experienced lifters, should be relatively uncomfortable as it is a working, not resting position. Your Serratus anterior muscle (front, off to the side rib-muscles - see image) muscles are extremely active during a proper front rack position. This makes it hard to breathe and move comfortably as your thoracic (chest) is fixed into a load-supporting position. If you find the front rack position easy breezy, you’re probably not doing something right, ask a coach. Stand with your palms facing away from your body on the same frontal plane. Try crushing imaginary walnuts under your armpits using just your armpit while keeping your arms completely straight. Holding that armpit-walnut crushing position, try to touch your thumbs to your shoulders, STILL on the frontal plane with your hands/fingers spread WIDE open. Holding the walnut crushing feeling and with your thumbs driving to your shoulders, lift your elbows forward and away from/off the frontal plane as high as they can go while holding the built tension in your armpit. Now grip the imaginary bar with you wrist straight. 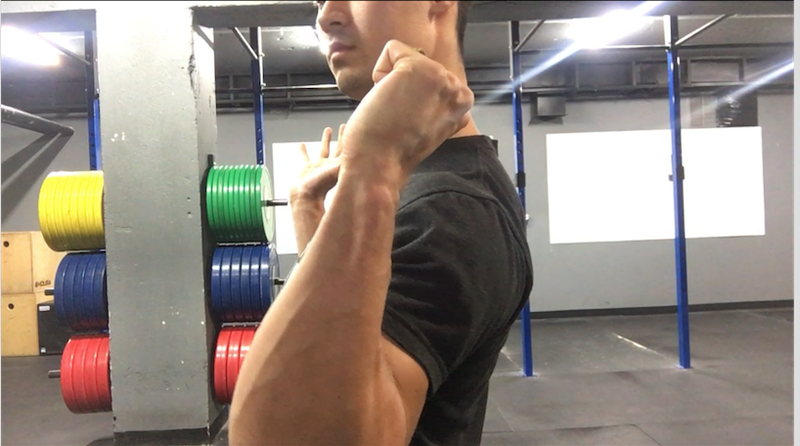 If you have hyper-mobile shoulders and elbows, the rule of thumb for a front rack position when looking at the wrist to elbow position is that they should make a “W” when looking head on. The wrist can be on the same sagittal plane (see right image), but not more proximal (closer) to the shoulder than the elbow. Meaning, if you were standing in your front position and I were in font of you and stuck a life-sized credit card perpendicularly through your elbow, you hand would fall on that dissection or distal (away from the body) to the card, NOT proximal (closer to the body). Hands and elbows super narrow, almost pinched together. Weight resting on the collar bone. Elbows perpendicular to the body (full 90 degrees). Wrists inside the sagittal plane of the elbow. Any fingers OFF the bar.